Joanna is one of our qualified nurses. She started training placements at Boness Vets in 2007 and became a permanent employee in 2011. 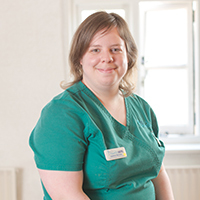 She trained at Harper Adams University College in Shropshire and has a BSc degree in veterinary nursing and practice management. Jo also has a Veterinary Practice Administration Certificate awarded by VPMA. She enjoys emergency work and is one of the night team for Beds vets. Jo also enjoys lab work and caring for the patients in the hospital. Jo shares her home with the awesome Trevor. He was a rescue kitten from work that she took home to foster and never left! He enjoys being the centre of attention and loves lots of treats.